The ride hailing industry in Uganda is slowly moving to the pedal sides of a motorbike dominated sector with Uberboda, taxify boda, Dial jack fastening strides against Safeboda. While we managed to have a one on one interview with the first ever Safeboda driver. The Orange camp has launched a new customer giveback promotion dubbed “I found the one” driving a new cashless riding experience in Uganda. As per Safeboda’s new campaign goals, this could be the gateway to Riding cashless on a motorbike since they are making the process smooth and better with the pioneer Safeboda driver, SB1 Moses Musinguzi. For each and every customer who gets a chance to hook up Moses Namba Emu for a trip around Kampala, the trip will be fully free of charge. The new Safeboda campaign “I found the one” was launched today at the company offices in Kamwokya where the head of customer support Eunice Among commended the new promotion as a bridge with customers on the Yello network to enjoy more for less as she asserted. 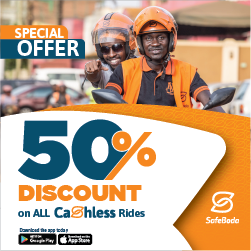 Although safeboda credit can be easily purchased through the app, MTN’s new partnership with the boda hailing firm brings a 25% bonus off all trip payments including free access to the app (Zero rated). In addition, MTN pulsers are also gifted with monthly safeboda vouchers for extra trips within Kampala. Nonetheless, as Safeboda’s driver No1 has started taking his last 50 trips in Kampala, the I found one campaign is just another reply to the ride-hailing squeeze in Uganda. Why could Government be delaying the 0.5% tax bill over the current 1% mobile money tax?